Belleville native Sarah Surmeier wrote and produced the video with Jazmine Rosales, of Huntley, as producer. View the video, which was also nominated among the top 10 for Best Overall PharmFlix. Meanwhile, Rosales recruited College of Arts and Sciences junior Spencer Peck, of O’Fallon, to direct the shoot. The cast of five SOP students consisted of Dalton Dieckow, of Bartonville, as the pharmacist; Catherine Gilmore, of Springfield, as Rose; Paris Smith, of Chicago, as Dorothy; Allison Hotop, of Perryville, Mo., as Sophia; and Kayla Link, of Springfield, as Blanche. SIUE won the award twice previously for “Batman the Pharmacist” and “Batman the Pharmacist 2,” in 2016 and ’17, respectively, which motivated Surmeier and friends. “I was a first-year when “Batman the Pharmacist 2” won, which I think was part of the reason we were so determined to keep the trend going,” she said. 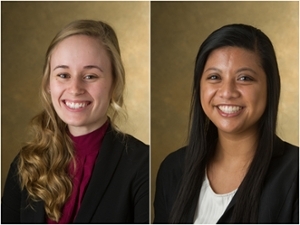 Photo (L-R): SIUE School of Pharmacy students Sarah Surmeier and Jazmine Rosales.